We are looking for donations to sell at our garage sale this upcoming Saturday. It’s the perfect opportunity to clean up before the holidays. Receipts will be given upon request. We ask that all donations be priced to sale. All unsold donations will be given away to other charities. Please drop off items at the Higa’s garage no earlier than Friday, November 20th @ 6:30 pm. If you can stay and help sort that would be wonderful. We need all the help we can get. Youth and parents are encouraged to help as long as they can. 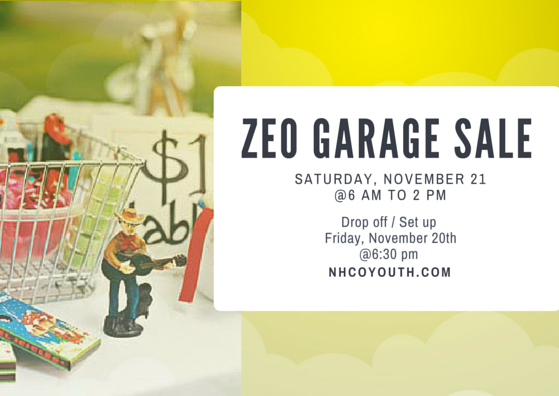 We are so blessed by this opportunity to help raise funds for our Zeo Camp and are so grateful to the Higa’s for their generosity and support. Please pray for blessings and protection over their home and family. Please respect their home and neighbors during this event, by limiting noise, and disruption in their street. If you have any questions or concerns, please feel free to call, text and email Bel Young at 808-554-9754 or nhcoyouthcomm@gmail.com. Thank you and God bless!